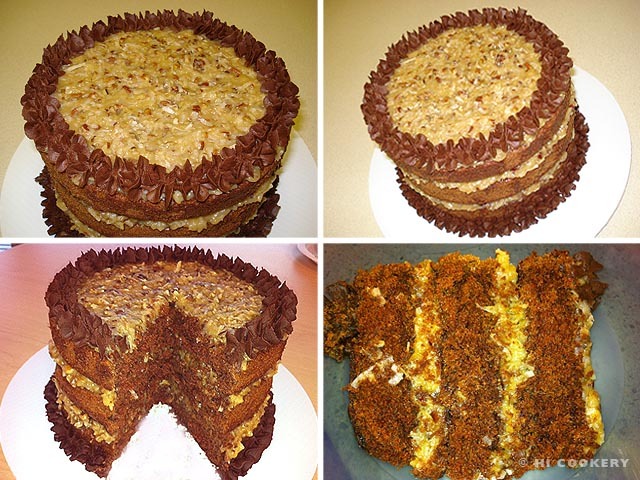 We get requests to bring a German Chocolate Cake for Oktoberfest or German culture themed gatherings. But we bake other Deutsch-style desserts, like Black Forest Cake and Apple Strudel, instead. 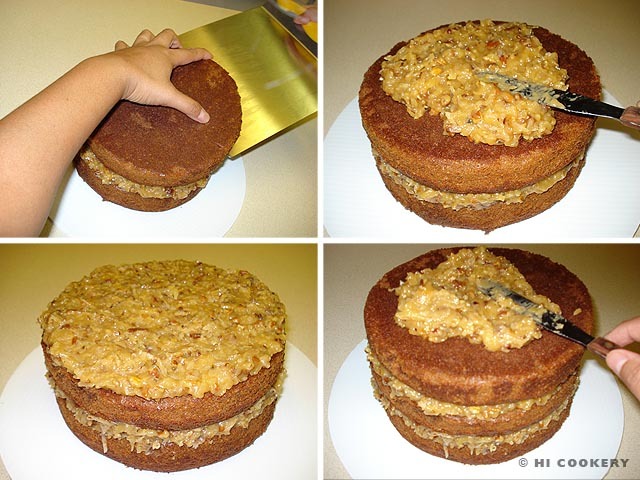 Despite the name, German Chocolate Cake is NOT German! And here is an opportunity for an edible education. Originally called German’s Chocolate Cake, the main ingredient—a sweet, dark chocolate bar—was named after Sam German, an American, who developed this specialty baking chocolate for American Baker’s Chocolate Company (Baker’s) in 1852. More than a century later, in 1957, a Dallas, Texas, homemaker sent the original recipe of German’s Chocolate Cake to a local newspaper. It was so popular that the recipe circulated to other newspapers around the country, helping to boost sales of the Baker’s brand German’s chocolate bar as much as 73%! Eventually, some publications dropped the apostrophe in German’s Chocolate Cake, giving the false impression that this dessert is actually from Germany. Yet even with this explanation, some still insist that we should bring German Chocolate Cake anyway. Who could blame them for wanting to indulge in a slice of rich, moist, chocolate cake that is traditionally layered with a complementary sweet, gooey coconut-pecan frosting? 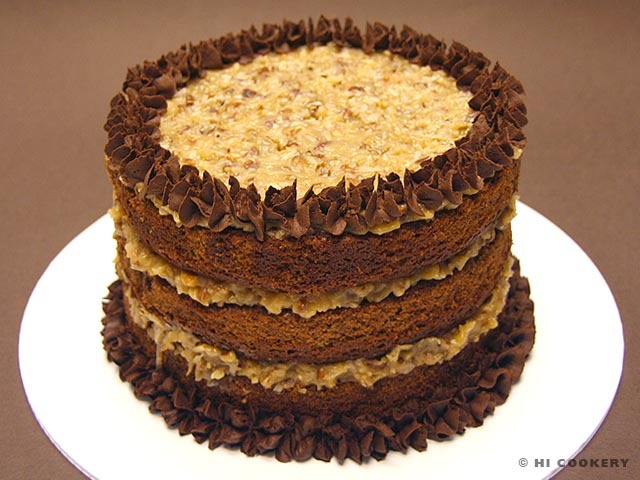 It is delicious for any occasion, especially for National German Chocolate Cake Day! Guten appetit! Prepare three 8- or 9-inch round baking pans by lining the bottoms with wax paper and greasing the sides. In a large bowl, break the chocolate into pieces. Pour in the water. Microwave on high for about 1 ½-2 minutes or until the chocolate is melted. Stir until smooth. In another bowl, combine the flour, salt and baking soda. Set aside. 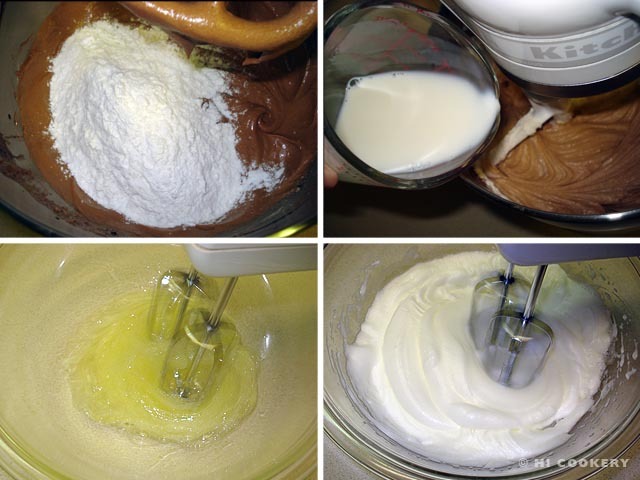 In a mixer, cream the butter with the sugar. Stir in the vanilla. Add the egg yolks. Pour in the melted chocolate and blend well. 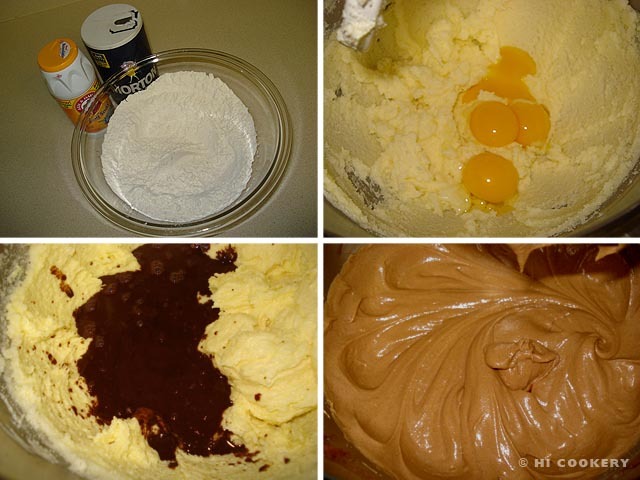 Gradually add the flour mixture, alternating with the buttermilk until the batter is smooth. In another bowl, whisk the egg whites with an electric mixer until stiff peaks form. 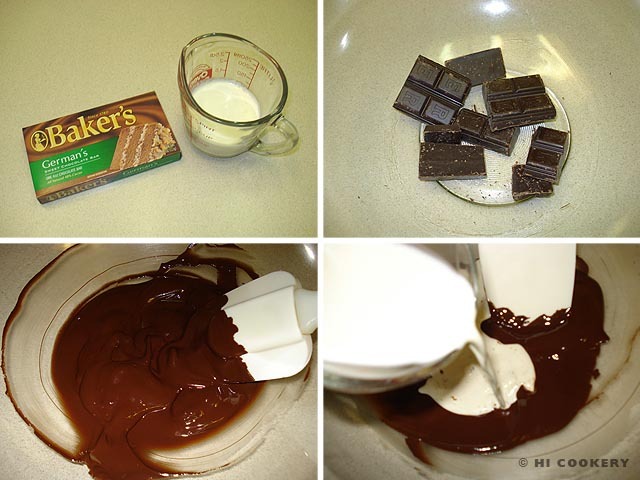 Fold into the chocolate batter. Divide evenly into the prepared pans. Bake in preheated oven at 350 degrees F for 30 minutes or until a toothpick comes out clean when inserted. Remove from the oven. 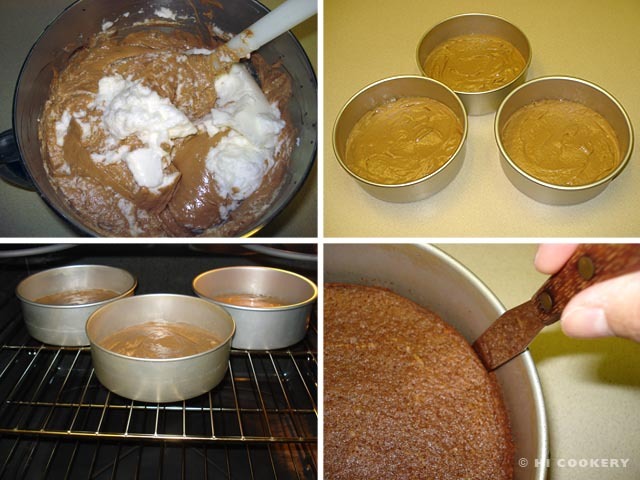 Immediately run a spatula around the edges of the cakes to loosen from the pans. Cool for 15 minutes, then carefully peel away the wax paper. Transfer the cakes to wire racks to cool completely. Make the coconut-pecan frosting. In a large saucepan, whisk together the egg yolks with the evaporated milk. Add the vanilla, sugar and butter. 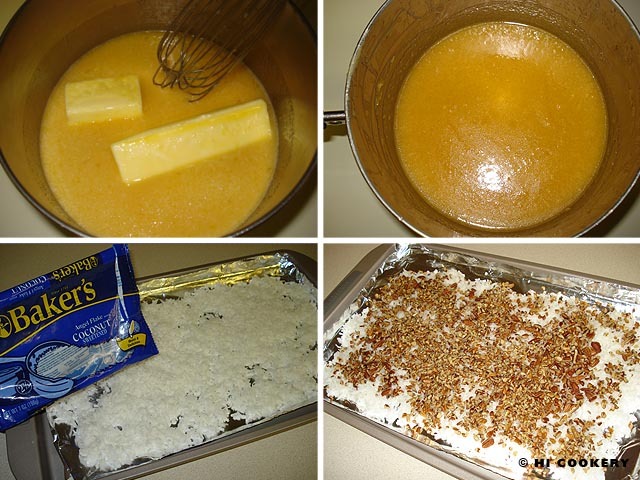 Cook on medium heat to melt the butter, continuously stirring, until thickened and the color starts to darken to a golden caramel color. Remove from heat and cool down. Meanwhile, on a foil-lined baking sheet, spread out the sweetened coconut flakes and chopped pecans. 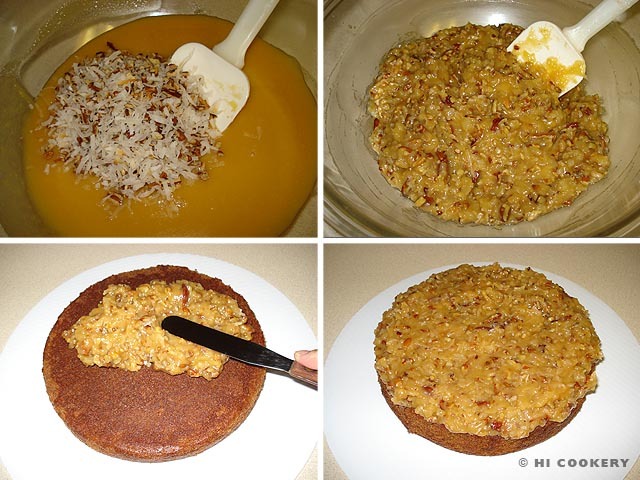 Toast in a preheated oven at 350 degrees F for about 7-8 minutes, being careful not to burn the coconut. Remove from the oven. Pour into the caramelized mixture and combine well. Cool the frosting completely before assembling the cake layers. Place the bottom layer of the cake on a plate or board. Spread a third of the coconut-pecan frosting on top. Place a second layer of the cake and spread with another third of the frosting. 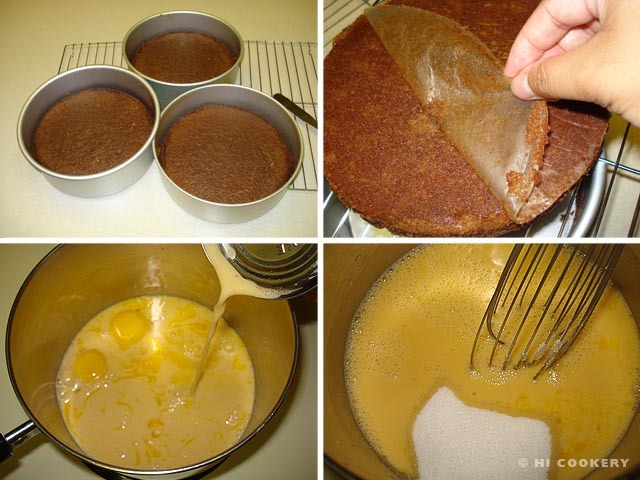 Place the final layer of the cake on top and finish spreading with the remaining frosting. Let cool to allow the flavors to set. In a large bowl, break the chocolate into pieces. 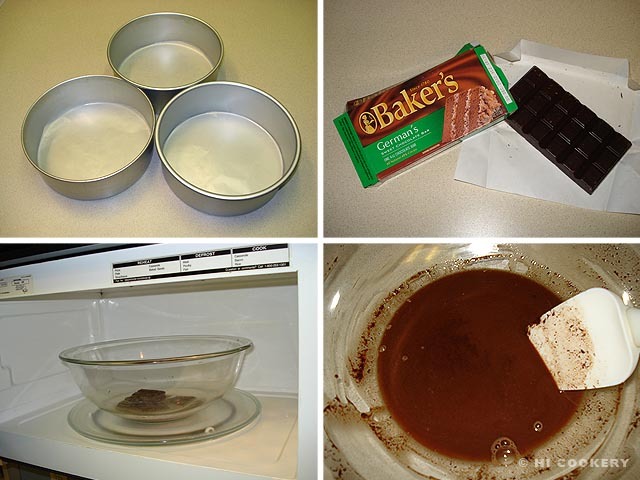 Microwave on high for about 1½-2 minutes or until the chocolate is melted. Pour in the cream. Stir until smooth and well blended. Cool at room temperature for about 2-3 hours. Whip the ganache with electric beaters until smooth and light. Let cool to thicken for at least another hour. Fill a pastry bag with a decorative tip (we used Wilton tip 2D). Pipe decorative borders on the top and bottom edges of the cake. The cake may be refrigerated but bring to room temperature before serving. 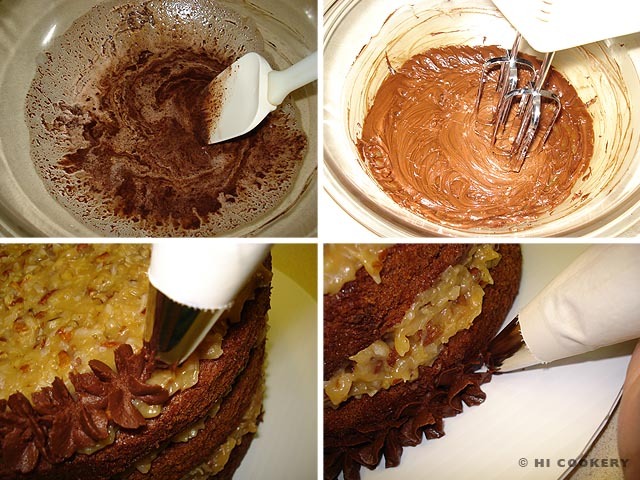 The sides of the cake may be frosted and decorated with more German chocolate ganache to hide the exposed layers and give a neater appearance to the coconut-pecan frosting. We used Wilton’s cake lifter to slide the layers of cake on top of each other. Search our blog for more chocolate cake recipes and real German dishes. Looks amazing and delicious !! !